Favorite horse show: the Old Salem Spring Horse shows. I grew up riding at Old Salem Farm and our farm and house are just down the street from it. All my childhood memories are from my time spent there riding with friends and it’s a place that is a big part of who I am today and will always be close to my heart. When I go there I feel at home and get to have friends and family who don’t get to watch me ride very often come to support me, and a win there means more to me than at any other show through the year. Major Goal for 2017: To have our team for the Global Champions League, the Miami Glory win the series. We have a really strong solid team this year and we are focused on being at the top of the podium at the final in November. Minor Goal for 2017: This is a rebuilding year for me as I have a few nice younger horses stepping up into bigger divisions, and no real experience Grand Prix horses. My goal this year is to have all my horses develop in a positive way and end the year jumping at a higher level than when they started. Any Good luck/superstition tradition you do before a big class: I wear a gold coin that my mother gave me in 2003 before I won the individual gold medal at the North American Young Rider Championships pinned in my pocket of my pants for every big important class. She gave it me before I left for the show and said to me that no matter what happens, I had already won the gold medal in her eyes. I wore it for those championships and have worn it in every Grand Prix or nations cup since. How do you manage nerves before a class: I try to take my mind off of things and calm any nerves, but still stay concentrated. I actually welcome some nerves and find that I ride better if I am a little nervous. Sometimes I am too relaxed and find that if I am a little nervous it makes me ride better and stay concentrated on the job ahead. I have come out of the ring a few times and said to myself, I should have been more nervous and tried harder, if I get too relaxed I feel that I don’t ride with the fire I need to sometimes. I have never had nerves be debilitating because I actually enjoy being in a spotlight and the center of attention. The more people watching, the more I enjoy competing. Plus, I always tell myself, there is no reason to be nervous unless you are unprepared or shouldn’t be in the class. And in that case, go home and prepare better or don’t jump at that level. You should be confident and prepared every time you go in the ring, and if there are some nerves, they should only ever be the kind that are because you really want to do well and are just nervous you won’t perform your best. 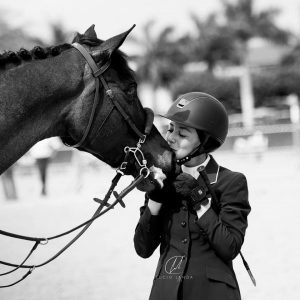 Every rider, has bad rounds and makes mistakes. That’s important to remember. 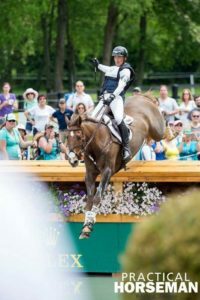 Not every jump is going to go as planned, and with the amount we compete, having things you would prefer didn’t happen is gong to happen to everyone quite often. 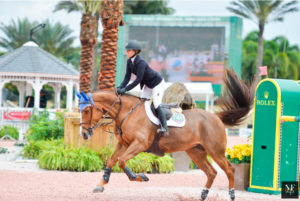 As long as you are properly prepared and not jumping at an inappropriate level for you or your horse, the only nerves you should have are the ones that are going to give you just a little extra desire to win. What’s one tip you could offer to young riders climbing to the top: To never give up, get discouraged or think you can’t make it no matter where you come from or how much natural talent you have. I have zero natural talent but as a child I was so determined to figure out how to win that I refused to give up, no matter how many mistakes I made or how many classes I lost. I worked hard at the sport and learned from anyone I could and refused to let things deter me from what I wanted to accomplish. Anyone who watched me ride as a kid would have never thought I would go on to accomplish any of the things that I have, but I knew that since I didn’t have the natural talent I would have to figure out a different way to be successful and that I would have to work harder than some of the other kids who did have natural talent. I am grateful that things were like this for me because it taught me a work ethic that you need for the sport and also it taught me to let loses and mistakes not effect me so much. Losing is a big part of this sport and you have to learn from them, and then not let them get you down or discourage you. You will make mistakes, you will lose lose lots of classes, and you will have all sorts of bad times in your career no matter what you come from and how you ride. But that’s part of this sport and you can’t let them sway you from the path you are taking and what you want to accomplish. If you can’t accept disappointment and loss, you are not going to make it in this sport. We all want to win, but learning from your mistakes and accepting there will be dips in your career, times when you can’t win, don’t have a horse, or have an injury, is an important part of sticking with it and learning how to win. Something no nobody knows about you: When I stop riding I want to study jewelry design and have my own collection. Your greatest strength: Determination and being too stubborn to give up. I love when people say negative things about me or say I can’t do something. It provides me with some fuel to prove them wrong and makes it so much sweeter if and when I can prove them wrong. Your greatest weakness: Self doubt. You have to believe in yourself and your horses in this sport, and confidence is one of the most important tools for being a top rider. I find that sometimes I doubt myself and don’t aim as high in my career or some of my goals and am always trying to fix that. What’s your favorite thing to do in your spare time: Just be at home with my animals, my son and spend time with friends. With the amount we travel for shows, the biggest luxury for me is having a free weekend at home to enjoy family time. Favorite pre-competition meal: cereal. It’s my favorite food and I always travel with some to have on the road at shows. Your most prized possession: My blankie. I still sleep with a blanket that my mother gave me when I was born. It’s 38 years old, (my sister had it as a baby before I was born) and I hate sleeping without it. I travel the world with it, (it’s even white water rafted down the grand canyon with me for a week) and sleep with it every night. It helps with traveling so much since it’s always something comfy and familiar smelling and I don’t plan on every giving it up. I used to be embarrassed that I was in my 30’s and had a blanket but now I own it and am proud of it! Favorite aspect about riding in Samshield: I genuinely feel safer in a Samshield helmet than in others, which as a mother in her 30’s who has had two concussions in her life, is something that is very important to me. But, the bonus is that I also love the way they look. I don’t think there is a better looking helmet on the market these days and I love that we can personalize them to match our barn colors and be color coordinated to our show clothes. 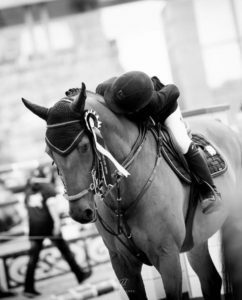 If you could pick just one memory from your riding career to keep: winning the very first Central Park Horse Show Grand Prix. I can’t say it was a dream come true because it was too special to have ever been something I thought could have happened. My entire family and my son were there watching and to have a victory like that in the middle of the city I grew up in was mind blowing. I remember walking out of the ring and looking up at the city lights and that is a moment I never want to forget. 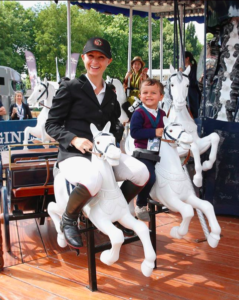 How has horse show life changed since becoming a mom: The traveling gets more exhausting and difficult because I either have to bring my son with me or be away from him, both of which have their challenges. I have to make the decision for each competition whether it is in his best interest or not to come with me, and if it will be somewhere that will be enjoyable and safe for him. When he is at a show I have two jobs, rider and mom and sometimes that is challenging with not as much sleep and not being able to concentrate fully on my competition or riding. But on the flip side having him around makes me happy and more relaxed so I find that sometimes I ride better because I am not constantly thinking about missing him or being anxious about getting back home to him. And of course if I go well, there is nothing better than being able to have him there cheering me on. I also have to pick shows that fit into his school schedule now that he is in preschool and also make a schedule that doesn’t make me travel as much so I don’t get to do a lot of the shows I would like to or have been able to do. Best advice you have ever received: Don’t let other people’s opinions or doubts affect you and what you set out to accomplish. I have so much respect for what my father has accomplished in life and how he has handled people who doubted him. When he started his company, he did so with his severance after being fired and no one thought his idea was a good one. He stuck with it and believed in his own vision and didn’t give up. The same situation happened when he decided he was going to run for Mayor of New York City. Most people thought he was joking and had no chance of winning. Not one negative comment or person who doubted him had any effect on him or what he had set for himself as a goal. When he won it must have tasted so much sweeter having had so many people tell him he couldn’t do it. I always try to let negative comments fuel me instead of deter me from what I want to and know I can accomplish instead. Don’t let others make you doubt yourself or have any effect on what you want to do with your life and goals you set for yourself. Best advice you have ever given: If you have the ability to and the chance to, go to college. Some riders don’t have the option and I understand that, but if you can, go to college or continue your education outside of just horses in any way you can. College is an experience I think every person should have and I disagree with kids who think that their riding is more important than what they will learn in college or the life experience they will have during those years. I studied a lot of sports media, management and business in my years at college and think it has helped my career immensely in my ability to understand the sport, how to market yourself and how to approach and represent sponsors which at the top level is almost just as important as your ability to ride if you want to be successful. Favorite travel destination: Bermuda. I spent the summers there are a kid at my Godparents house and now we have a family home there that I escape to every chance I can. It’s my happy place and I think the most beautiful beaches in the world. Favorite animal rescue organization: I work with so many incredible smaller organizations who all do so much, but my favorite dog rescue is Danny and Ron’s Rescue. I have two amazing dogs from them and I have so much respect for the work they do. Danny and Ron are both horse people who started taking in dogs after Hurricane Katrina. They have since rescued thousands of dogs, giving up every moment of their free time and every cent they earn to saving as many as they can. Not only do they save the lives of so many dogs, but they also work hard to make sure that every dog gets into the perfect home and is happy and safe which is hard work. They follow up and remember the dogs they have placed, and once you adopt a dog from them you feel a connection to them and what they do. I always say people should do as much to help a cause they care about as they possibly can. Danny and Ron are the ultimate example of this. Do any of your horses have any funny quirks? Manodie who is my top horse right now has to pee in the schooling area every time we are competing. If she doesn’t pee, I know she won’t go well. C: My major goal for 2017 is to jump clear in a 4* or 5* Grand Prix. L: My major goal for 2017 is to jump consistently at the next level, hopefully all the way up to 4* and 5* Grand Prixs. 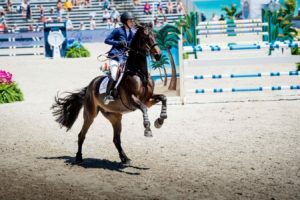 C: My minor goal for 2017 is to win a 2* Grand Prix. L: My minor goal for 2017 is to perfect the smaller and more technical aspects of flat work and courses so that it starts to become second nature to me. C: Wear a pink coat, compete for the USA, travel to Asia, and compete on a team event with my younger sister Lilli. Last 3 items purchased on your credit card? If you could stay a certain age? The last time you were nervous? C: The last time I was nervous would probably be my first show in Europe this summer. L: The last time I was nervous would probably be this summer in Cannes when I was watching the last person jump off while I was in the lead. It was the first big jumper class I ever have won. I knew I did everything I could but the rest is out of our control so I got pretty nervous!! What do you do with 30 minutes of free time? L: Probably reading things online or reading a book. Unless my dog is around, then playing with her for sure. Did you ever have something bad happen that turned out to be good? C: I had a really bad break up in March but it turned out to be the best thing for myself as an individual. Being alone has made me grow and figure out certain aspects of my life that I didn’t understand before. L: Yes of course!! I’m a firm believer in everything happens for a reason so I like to believe no matter how horrible you feel a situation is, it is usually meant to be. I recently went through an experience that I felt flipped my world upside down, but now it really seems to have flipped my world right side up- putting things in perspective that I couldn’t see clearly before. If you stick to that mindset, most seemingly bad things turn out to be just fine. L: A gift card. It’s the thought & effort that counts for me, and there’s so little effort required to just pick a gift card- I feel like it’s a cop out. Your first memory of being really excited? C: For some reason I can really recall the day I won the lead line at the Hampton Class Horse show when I was 4 years old. I remember just feeling very accomplished and my parents taking a lot of pictures of me on our pony Blackie. L: When I was about 9 years old I found this website online that sold miniature ponies and I somehow convinced my dad it would be a good idea to let me call them myself and purchase Cloe and I each one. Standing outside of our barn as a little girl, watching them get off the trailer is my first memory of being really purely excited. C: I usually calm my nerves by going over my plan for the course a few times in my head. Talking with my trainer, Brianne Goutal, and asking any questions I have about the plan. Also, once I get on whatever horse I am competing on my nerves usually go away. L: I usually manage my nerves by making sure to prepare mentally before the class. I don’t like to wait until I’m actually nervous to deal with my nerves; I like to prepare for them before they come so that my mind is not taken over by them. Meditation and mindfulness have helped me tremendously with nerves. If you practice and understand why nerves get in your way, usually before a big class all you have to do is remind yourself what you already know. For me, I am now able to acknowledge that my nerves are just thoughts in my head. So I remind myself of this, make sure to take a deep breathe, and then re-focus on the course coming up. C: My favorite aspect of competing in Europe is the audience the sport draws in. In America it seems sometimes that the shows are in more remote areas so there are less crowds and here in Europe the competitions I have been doing are more centrally located. It is definitely an amazing feeling having a crowd routing for you. L: My favorite aspect about showing in Europe is the change of scenery and ambience. It is really refreshing and exciting to have a crowd that is intrigued by what you are doing. It is also of course unbelievably lucky that we get to go to such beautiful places while doing what we love. How showing in Europe differs from showing in the U.S.? 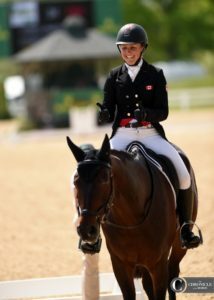 C: I think one main difference I have noticed from showing in the states is being able to spend more time in the ring. Sometimes they let you go in the ring and move your horse around when you are still 2 or 3 out. It’s definitely helpful to get your horse in the ring earlier and give them and yourself a moment to breathe. L: Because of the schedule we made this year for us in Europe, I can’t speak to much other than the shows I experienced myself. 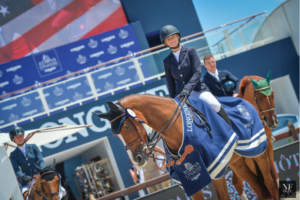 What I experienced was that the places we show at in the states usually offer many different divisions for you to compete many different horses in, whereas in Europe there was usually only 2 heights you could jump, according to what * you were jumping. 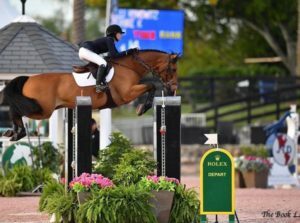 For instance, if you only had one horse to jump in the 5*, you couldn’t also jump in the 1* or 2* with a younger, or less experienced horse. I saw this as both an advantage and disadvantage. C: The first thing I’ve bought with my winnings is a new pair of gloves at the horse show tack store. Not very fun but I got a great gift card once! L: I’ve never bought anything with my winnings! They usually just go back into paying for the show we’re at which I feel accomplished to help out with always! 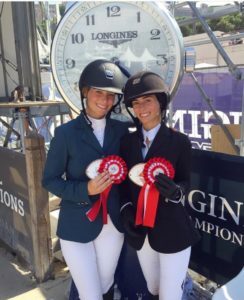 C: I’m such an open book but something most people in the horse show world don’t know that I have another older sister. L: Most people probably don’t know that I actually hate how much I use my phone and I always make sure to set times where I put it away and am completely present with whatever I’m doing. C: Hopefully in 5 years I will be competing mostly in Europe and jumping 5* nation cups. Maybe living with my sister or someone in Europe and traveling to Wellington for the winter. I also would love to work in media for a company involved in the sport. C: Lilli and I recently both went through pretty bad break ups. In the beginning of my breakup my dad suggested I try writing down how I felt anytime I was feeling down. That really helped me get my feelings out of my head. Slowly I started exercising almost everyday and writing; the combination of the two really got me back on my feet. I regained a lot of my confidence from being in the gym and working hard. When Lilli went though a bad breakup I tried to use the tools I learned to help her. I encouraged her to come to the gym with me each day and with time we got into a really good routine. Exercising helped us stay level headed in both our personal life and in our sport. We had the idea to start our blog Eve and Sofia when I realized that being there for each other and encouraging one another to stay fit and mentally healthy really helped us move forward. We wanted to share that experience with people and be that encouraging role so many people can benefit from. L: Cloe and I went through something that seemed to pull our lives out of our hands and take what we thought was our future from us. Luckily for me, it happened to Cloe a few months prior to it happening to me. Her going through everything before me, made her one step ahead of me in the healing process. It just so happened that we were in Europe for 5 weeks when things changed for me. I didn’t know how to regain control of my life or how to face the next 5 weeks of intense competition feeling like this. Cloe got me on my feet with my chin up every single day and I just tried my best to follow in her lead. Eventually we realized that by lifting each other up, we were lifting ourselves up too. There are so many people out there going through something that just need someone to tell them they are not alone, they will be okay, and to just keep going. Once we realized that, we realized that really we could take what we’ve learned from each other and be that source of light & energy for other people. Why do you choose Samshield? C: I love the slick look it gives you and the more matte color. I think it’s important to also feel comfortable in your helmet and the Samshield sits really well on my head, not too high not to low. I love it! L: As soon as I put on Samshield I knew it was right for me. The look is slick and modern and the feeling is perfect. Every other helmet looked too big and I never felt as confident as when I put on my Samshield. Major Goal for 2017: My major goal for the year is to try to move up and jump a few more 1.50 classes and 3* Grand Prixs. I would love to be able to try to be competitive and place well in some of those classes. Minor Goal for 2017: I think my minor goal is always to keep improving and learning, as well as to continue developing my partnerships with my horses. I have a very nice 9 year old right now, so my goal with him is to continue moving him up to eventually jump ranking classes. Where do you attend school and what do you study? I just finished my sophomore year at the University of Miami. I major in Public Relations. 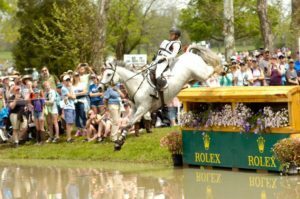 How do you manage attending school while horse showing? A lot of time management! I make sure to always put aside time to get my work done, so I never feel like I am behind. My school has also been incredibly supportive and instrumental in making it work for me, helping me to arrange my schedule on Mondays, Tuesdays and Wednesdays so that I can focus on riding and competing on the weekends. So far, my professors have all been very understanding of my schedule! Any Good luck/superstition tradition you do before a big class? I don’t really have any superstitions. I get anxious if I’m late or rushing, so I always make sure to leave myself plenty of time to get ready, walk my course, and warm up my horse. What’s one tip you could offer to young riders climbing to the top: To take advantage of every learning opportunity, whether it be watching classes, reading books or just sitting and watching the warm up ring. Something no nobody knows about you: I have an unhealthy obsession with cookie dough. I eat way too much of it! Your greatest strength: I think my greatest strength is my dedication and passion for the sport. Your greatest weakness: I would say my height is one of my biggest weaknesses. I am pretty short, so I don’t have the natural strength or power that taller riders do. I try to make up for that though by going to the gym and staying as strong and fit as possible! What’s your favorite thing to do in your spare time: In my spare time I am usually either working out, watching TV or spending time with friends. Any must haves for traveling: I always bring a comfy neck pillow whenever I am going on a plane. It may look ridiculous but I pretty much always sleep well on planes! I also always make sure to have Advil with me, it always ends up coming in handy! Favorite pre-competition meal: I don’t like eating too close to my class, but in the mornings I like to eat either yogurt and granola or eggs so that I feel energized for the day. Your most prized possession: Cimi! Not really a possession, but definitely don’t know what I would do without her! Favorite aspect about riding in Samshield: I absolutely love my Samshield. I think that it is extremely sleek and stylish looking, while also being comfortable and extremely safe. 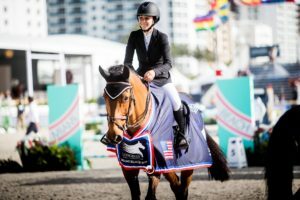 If you could pick just one memory from your riding career to keep: Winning my first Grand Prix/ranking class at the first ever Global Champions Tour in Miami Beach. It was my first Grand Prix on Cimi (Von Cim) and to win it in front of my whole family and with all of my friends there to support me was such an incredible feeling. #1 most memorable lesson you have learned while riding with Kent: Kent has taught me so much, it is hard to choose just one! I think one of the biggest lessons that I have learned from Kent is how to use each individual horse’s strengths to my advantage. If you look at Kent’s horses throughout his career, you see a large variety of horses with many different ways of going. However, he was able to win on pretty much all of them. He has taught me how to be competitive on different types of horses by using their strengths in jump offs, whether it be turning tighter on a horse with a smaller stride, or leaving out a stride on a slower horse where not many other horses could. Do any of your horses have any funny quirks: I think all of them do! Charley would probably be my strangest horse. He likes to stick his tongue out and either bite it or shake his head vigorously so it just whips around. He also likes to bite his lips, and if you put a chain in front of him he rubs his teeth against it and just weaves back and forth for however long you let him. Favorite clothing in and out of the ring: I wear a mix of different brands of show clothes. 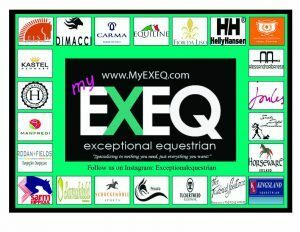 I really like the brand Carma, but also have shirts from Equiline and Alessandro Albanese and wear show coats from Animo. 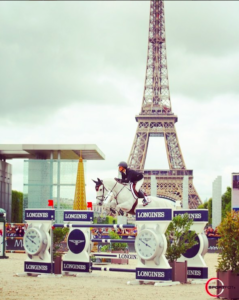 Best part about horse showing in Europe: I love how in Europe, show jumping is thought of as a sport. The crowds are always amazing and very knowledgable and the shows feel a bit like sporting events. I also love the high level of competition in Europe, it forces you to raise your game. 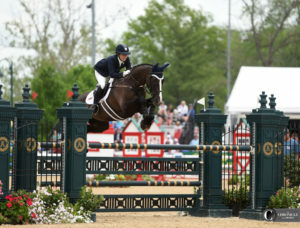 What a week at #RK3DE, in the beautiful Lexington, Kentucky. We would like to congratulate all of our riders for competing a grueling three days of competition. 4/27-5/7 Texas Rose Horse Park, Tyler, TX.